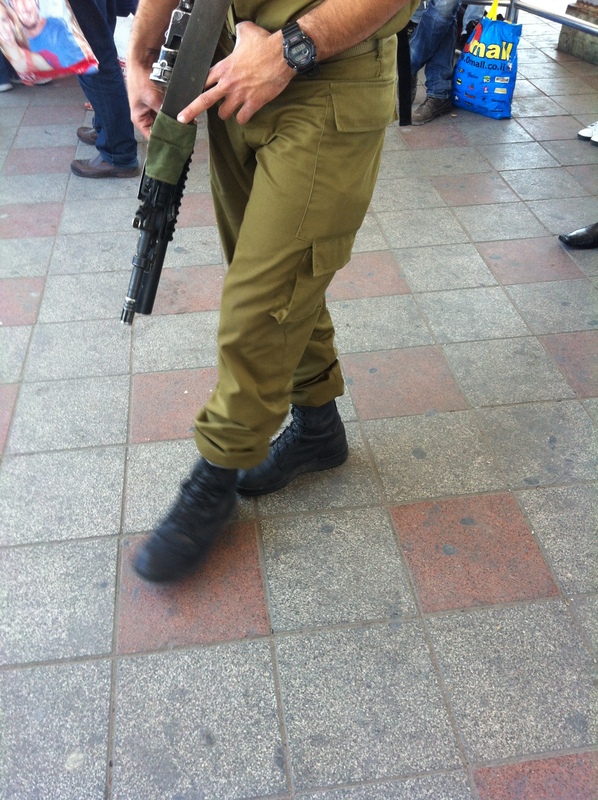 You see a lot of young Isreali soldiers here. Military service is mandatory for young men for three years, and two for women, after they finish school. I understand there to be certain permissible exceptions, such as Palestinian-Israelis and Orthodox Jews, and some pacifists, although there is a current highly-publicised case of a nineteen-year-old from Haifa who is in prison, and has been on and off for some months, for seeking conscientious objection under grounds that do comply with the IDF’s definition of pacifism – more here (from Harriet Shirwood at the Guardian). Most buses I’ve taken have had a few uniformed soldiers travelling on it. Sometimes you’ll end up sitting next to one, and sometimes they have their massive guns slung over their shoulders, too. Please note: These views do not represent my own views, and neither do I claim that they are representative of other Israeli soldiers – they are just the views of one person I spoke to on a bus, which I am sharing because they represent a different perspective and experience to many of the others I’ve been hearing, and sharing on this blog. Strongly agree or disagree? Feel free to (respectfully) comment.